When I told my cousin I was going to visit on my way through to Hong Kong, he immediately asked me, “What do you want to eat?”. Family is such a great thing sometimes. 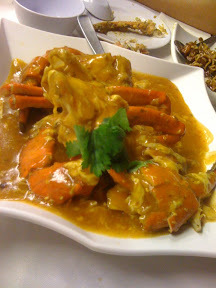 I of course replied with a list of things, the top of which was chilli crab, because I had not been able to try it last time I was in Singapore, due to a bout of gastro. He replied that would be pretty easy, and then asked me a much more exciting question; “But have you tried the salted duck egg crab?” The what!? I’d never heard of that dish, but I knew of the technique involved, as in Melbourne you can quite commonly get chicken ribs cooked the same way. The thought of crab done this way was a little mind-blowing, but of course, I had to try this cholesterol bomb! What better way to kick off my #fatty adventure? 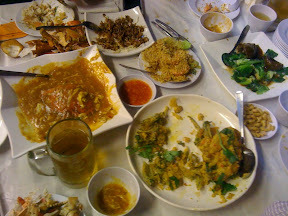 We went to Jumbo Seafood, which I understand is a local chain of seafood restaurants – probably something of an authenticity fail, but hey, we seemed to be surrounded by lots of Singaporean families, so it can’t be that bad, right? In fact, it was all pretty good. Not good for me, but definitely good eating. We started off with some deep fried baby octopus. The little cephalopods were super-crispy, and coated in a salty-sweet glaze. This is one of those near-ultimate beer snack dishes. I could, though probably shouldn’t, eat these all day. My cousin got rather excited when it came to the next dish: cereal prawns. Sounds weird, right? Basically, it’s some butterflied deep fried (sensing a theme here yet?) 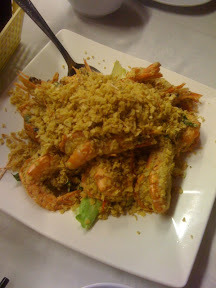 prawns, heads and shells still intact, coated with warmed, slightly sweet cereal crumbs. I’m not sure exactly what cereal it was, but it tasted slightly malted. 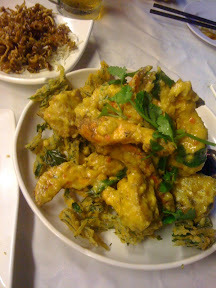 In any case, they were great, and when we ran out of room at the table, and the waitress went to transfer what was left of the prawns onto a smaller plate, my cousin insisted that ALL of the remaining cereal be transferred along with the few remaining prawns. Onto the main event. The salted duck yolk crab arrived at the table, and you could completely see why the Chinese call this dish gum saa hai (golden sand crab). 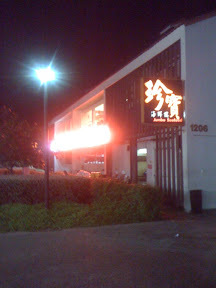 The yolk was glistening all over the pieces of crab, and it tasted every bit as rich as the Chinese name makes it sound. Served on a bed of crisply fried battered basil leaves, this dish was probably the highlight of my short stay in Singapore. 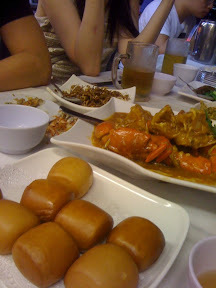 Because you have the option of ordering different sized crabs, we ordered two medium sized ones between the four of us, which meant I finally got to try chilli crab in Singapore too! To be honest, I was expecting a bit more spice. And I also wasn’t expecting it to be slightly sweet. I’m not sure if it’s all done this way in Singapore, and I enjoyed it, but I’m not sure it’s the stuff of legend. I’m guessing perhaps there are better versions of it to be found. The next revelation, though, was a much simpler thing. Fried mantou (steamed bread). So these mantou are steamed, then fried to give them a crunchy ‘crust’. Mantou are the same bread as used to make bao (Chinese steamed buns – you know the ones, with the roast pork in them), so they’re slightly sweet. 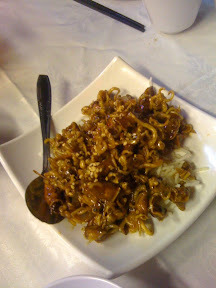 In this case, their express purpose is to be used to mop up the various sauces of the other dishes. Crunchy and yet fluffy and sweet? A total winner. There was also a dish of mushrooms and greens, but as you can see below (on the right) it didn’t really attract as much of our attention as the other dishes. All in all, this was a great meal. Anything involving two crabs usually is, hey? The cereal prawns and salted duck yolk crab look so good! I'm jealous! Still have yet to try salted egg dishes… one day soon! Those buns look amazing, like jersey caramels.